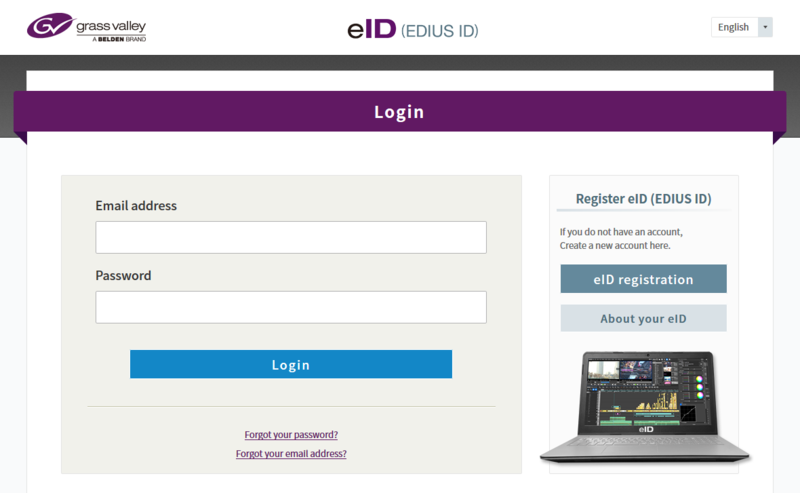 EDIUS 9 uses the EDIUS ID (eID) registration – like EDIUS 8 and Mync. You can download this document in PDF format also. Your eID is linked to your serial numbers and helps you to keep track of the status of your product activations. When you activate the test or full version of your EDIUS 9, you will be asked to enter an eID. If you already have an eID from the activation of EDIUS 8 or Mync, you can simply enter that eID. (If you would like to request a test version with an existing eID, please jump directly to step 10). If you do not have an eID yet, please create one. Here we explain step by step how to do it. An eID consists of an e-mail address and a password. When you start EDIUS for the first time after installation, the following window will pop up. 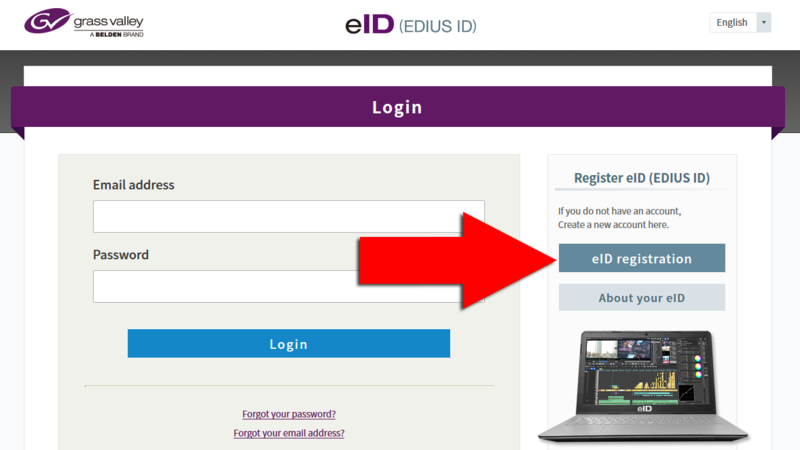 To register an eID for the first time click on the [eID registration] button on the right hand side. 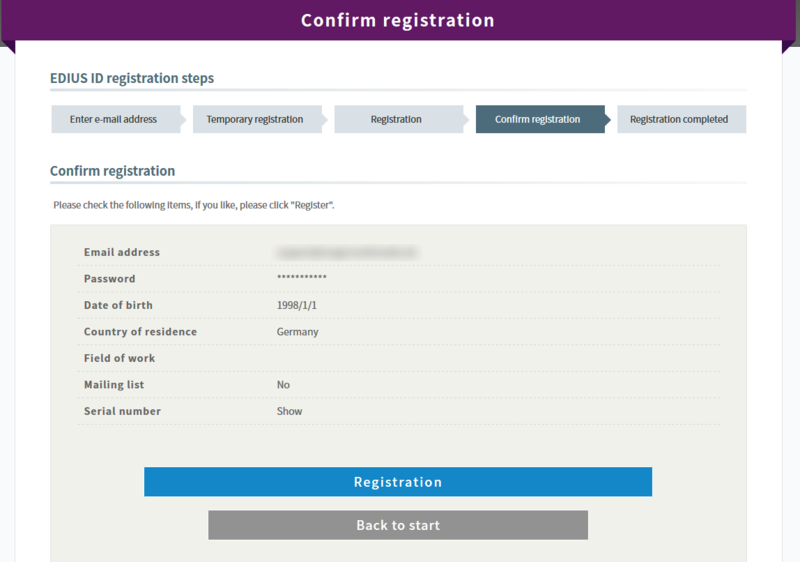 A temporary registration confirmation will be sent to you by e-mail to verify your e-mail address. If you have not received any e-mail please check your spam folder. Thank you for creating an eID. We have received your preliminary registration. Please click the following URL link within 48 hours to complete this registration. You cannot use the eID until you complete this registration. · This URL is valid for 48 hours from the time of this email. Your registration will become invalid if you do not complete the procedures within 48 hours. · Until the registration is completed, the registration remains preliminary and the eID cannot be used. · This email is sent as a result of you creating an eID. If you were not expecting this, do not complete the rest of the registration procedure. If you have already accidentally completed the registration, contact our support center. · This email was sent from an email address used only for sending messages. Please be aware that we cannot respond to replies sent to this address. Thank you for your continued support for Grass Valley products. The registration web page will open. Please complete all the required fields. Confirm your data by clicking on the [Confirm] button. 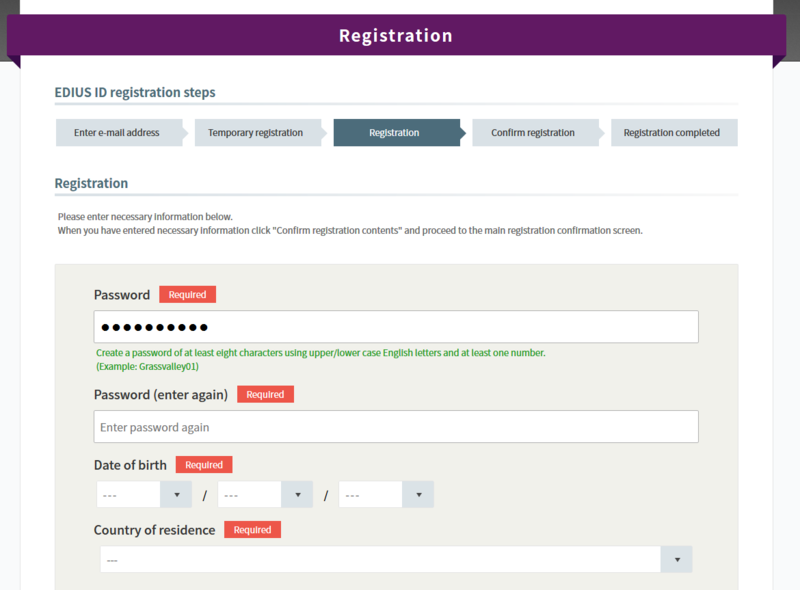 Complete the registration by clicking on the [Registration] button. If you want to revise a field, click on the [Back to start] button. The eID registration is now completed. A confirmation is also sent to you by e-mail. 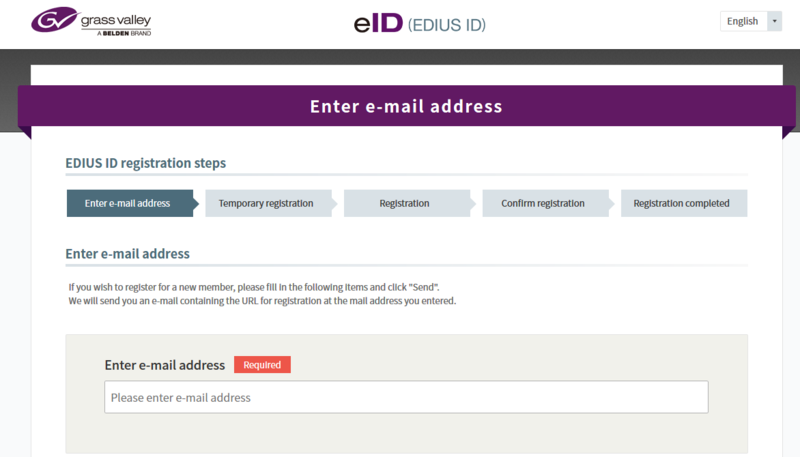 If you already have an EDIUS 9 serial number, you can now use EDIUS 9 with your registered e-mail address and password. The e-mail address and the password combination is your eID. Type in your e-mail address in the field [E-mail], and your password in the field [Password]. Next you will be asked to type in your EDIUS 9 serial number or in case of an upgrade also the serial number of the previous EDIUS version. Now you can start working with EDIUS. To view the status of your EDIUS license activations please log in with your e-mail address and password online on https://ediusid1.grassvalley.com. You can also always check your given information and make any amendments thereto by clicking on this link. The following steps are only necessary when requesting a serial number for a test version. 10. Log in via https://ediusid1.grassvalley.com with your eID. 11. Click on “EDIUS” on the left in the menu and choose the desired version. 13. You will receive an e-mail with the serial number for the requested test version. Please go to step 9 in order to activate the licence. For further information and support please get in touch with your EDIUS reseller.